By the age of eighteen, the average adult has 32 teeth; 16 teeth on the top and 16 teeth on the bottom. Each tooth in the mouth has a specific name and function. The teeth in the front of the mouth (incisors, canine and bicuspid teeth) are ideal for grasping and biting food into smaller pieces. The back teeth or molar teeth are used to grind food up into a consistency suitable for swallowing. Questions about wisdom teeth in West Jordan or Salt Lake City, Utah? Call our office for a consultation. Questions about wisdom teeth in West Jordan or Salt Lake City, Utah? Call our office for a consultation. With an oral examination and x-rays of the mouth, Dr. Urban can evaluate the position of the wisdom teeth and predict if there may be present or future problems. Studies have shown that early evaluation and treatment result in a superior outcome for the patient. Patients are generally first evaluated in the mid-teenage years by their dentist, orthodontist or by an oral and maxillofacial surgeon. All outpatient surgery is performed under appropriate anesthesia to maximize patient comfort.Dr. Urban has the training, license and experience to provide various types of anesthesia for patients to select the best alternative. In most cases, the removal of wisdom teeth is performed under local anesthesia, laughing gas (nitrous oxide/oxygen analgesia) or general anesthesia. These options as well as the surgical risks (i.e. sensory nerve damage, sinus complications) will be discussed with you before the procedure is performed. Upon discharge, your post-operative kit will include postoperative instructions, a prescription for pain medication, antibiotics and a follow-up appointment in one week for suture removal. If you have any questions, please do not hesitate to call us at West Jordan Office Phone Number 801-282-5363. 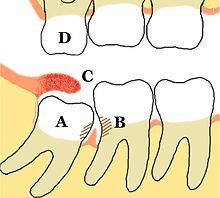 Wisdom teeth areremnantthird molars that used to help human ancestors in grinding down plant tissue. The common theoryis that the skulls of human ancestors had larger jaws with more teeth, which were possibly used to help chew down foliage to compensate for a lack of ability to efficiently digest the cellulose that makes up a plant cell wall. As human diets changed, smaller jaws gradually evolved, yet the third molars, or wisdom teeth, still commonly develop in human mouths. What is the clinical significance of Wisdom Teeth? Wisdom teeth (often notated clinically as M3 for third molar) have long been identified as a source of problems and continue to be the most commonly impacted teeth in the human mouth. The oldest known impacted wisdom tooth belonged to a European woman of the Magdalenian period (18,00010,000 BC).A lack of room to allow the teeth to erupt results in a risk of periodontal disease and dental cavities that increases with age.Only a small minority (less than 2%) of adults age 65 years or older maintain the teeth without caries or periodontal disease and 13% maintain unimpacted wisdom teeth without caries or periodontal disease. Some problems which may or may not occur with third molars: A Mesio-impacted, partially erupted mandibular third molar, B Dental caries and periodontal defects associated with both the third and second molars, caused by food packing and poor access to oral hygiene methods, C Inflamed operculum covering partially erupted lower third molar, with accumulation of food debris and bacteria underneath, D The upper third molar has over-erupted due to lack of opposing tooth contact, and may start to traumatically occlude into the operculum over the lower third molar. Unopposed teeth are usually sharp because they have not been blunted by another tooth (attrition). Impacted wisdom teeth are classified by the direction and depth of impaction, the amount of available space for tooth eruption and the amount soft tissue or bone (or both) that covers them. The classification structure allows clinicians to estimate the probabilities of impaction, infections and complications associated with wisdom teeth removal.Wisdom teeth are also classified by the presence (or absence) of symptoms and disease. Treatment of an erupted wisdom tooth is the same as any other tooth in the mouth. If impacted, treatment can be localized to the infected tissue overlying the impaction,extractionor coronectomy. Why do we call wisdom teeth wisdom Teeth?? Although formally known as third molars, the common name is wisdom teeth because they appear so late much later than the other teeth, at an age where people are presumably wiser than as a child, when the other teeth erupt.The term probably came as a translation of the Latin: dens sapientiae. What does a painful wisdom tooth look like? What are the classifications of wisdom teeth? The upper left (picture right) and upper right (picture left) wisdom teeth are distoangularly impacted. The lower left wisdom tooth is horizontally impacted. The lower right wisdom tooth is vertically impacted (unidentifiable in orthopantomogram). Does everyone need to have their wisdom teeth removed? An impacted wisdom tooth can damage neighboring teeth or become infected. Because its in an area thats hard to clean, it can also invite bacteria that lead to gum disease. Oral bacteria can also travel through your bloodstream and lead to infections and illnesses that affect your heart, kidneys and other organs. In some cases, a cyst or tumor can form around the base of the impacted tooth, which can lead to more serious problems as it hollows out the jaw and damages surrounding nerves, teeth and other parts of your mouth and face. What are the indications for removal of wisdom teeth?